growing up, i was fortunate to live in an area where i could be exposed to a lot of different types of food. 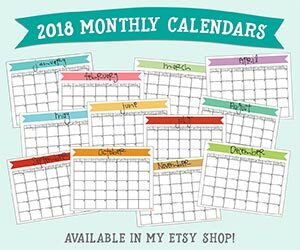 my friends’ moms would make me authentic pupusas, my dad had a friend who owned an egyptian restaurant, there was a korean market down the street from where i worked, and when i went out for a lunch date with my dad he’d often take me to get chinese food from a really good chinese restaurant. i grew to love all these different types of food and now that i’ve moved to a less diversified place in the food sense, i miss being able to taste all these amazing flavors! so i took my sister’s recipe for chicken lo mein and made it at home, and it has become a favorite of mine when i’m craving some of those foods i grew up with. and not only is it a cinch to make, but it’s quick and delicious too, which means that even if i did have a chinese restaurant close by, i’d probably still make it myself at home! first, gather your ingredients. 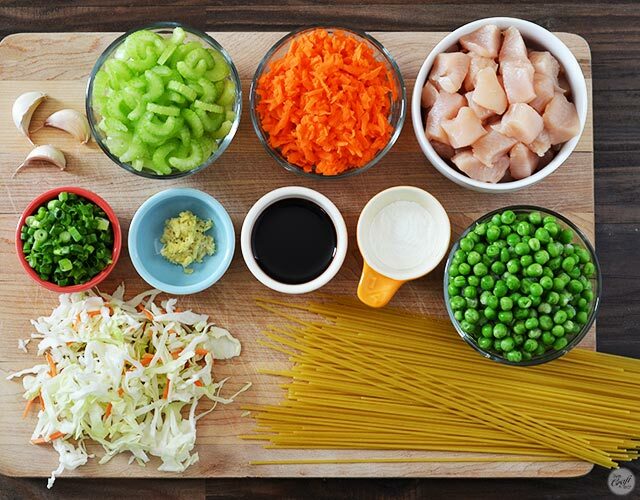 they’re really easy to prep, and if you like asian flavors, you’ve probably got a lot of these things on hand already: diced chicken breasts, shredded carrots, sliced celery, frozen peas, garlic, scallions, grated ginger, shredded cabbage (sometimes i just use bagged coleslaw mix with grated cabbage and carrot), soy sauce, cornstarch, and spaghetti. you’ll also need chicken bouillon, or chicken stock – it doesn’t matter which one you use, it’s totally up to you. you’ll want to get your spaghetti into boiling salted water and cook it according to the package directions so it’s ready when everything else is. 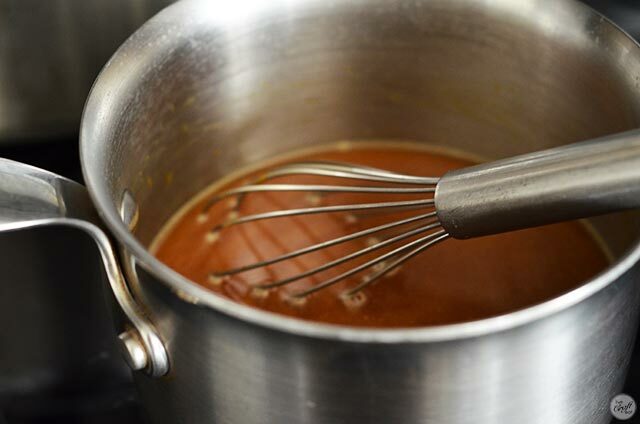 if you’re using chicken bouillon, you’ll want to add it to 2 cups of boiling water in a small saucepan. when it’s dissolved, pour 1/2 cup from the saucepan into a large skillet and let the remaining 1.5 cups cool. if you’re using chicken broth/stock, put 1/2 cup into a saucepan and 1.5 cups into a small saucepan. bring the broth in the skillet to boiling. add the chicken and let it simmer for a few minutes until the chicken is cooked through. then take the chicken pieces out of the skillet and place them in a separate bowl. discard the extra liquid in the skillet – it has fulfilled it’s flavor purpose. …add it to the broth that has been cooling in the saucepan, stir it together, and set aside. heat oil in a skillet and add the garlic and ginger, and cook for just half a minute or so until it starts to become fragrant, stirring constantly so it won’t burn. 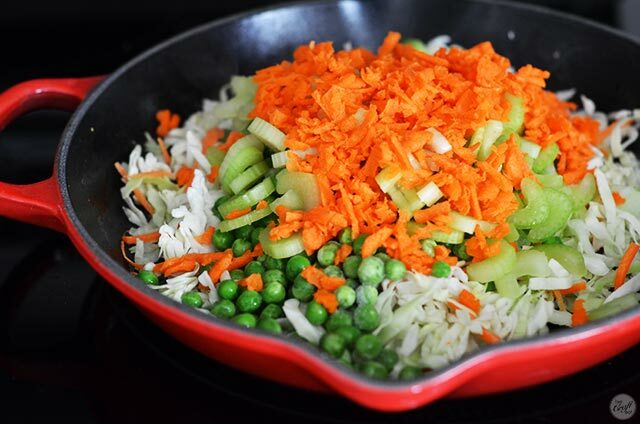 then add the cabbage, celery, peas, and shredded carrot. stir it together and cook until heated through, about 2 minutes. then add the cornstarch mixture from your saucepan and continue cooking and stirring until the sauce has thickened slightly. add the cooked chicken back into the skillet along with the spaghetti noodles and give it a toss. sprinkle sliced green onions over the top. 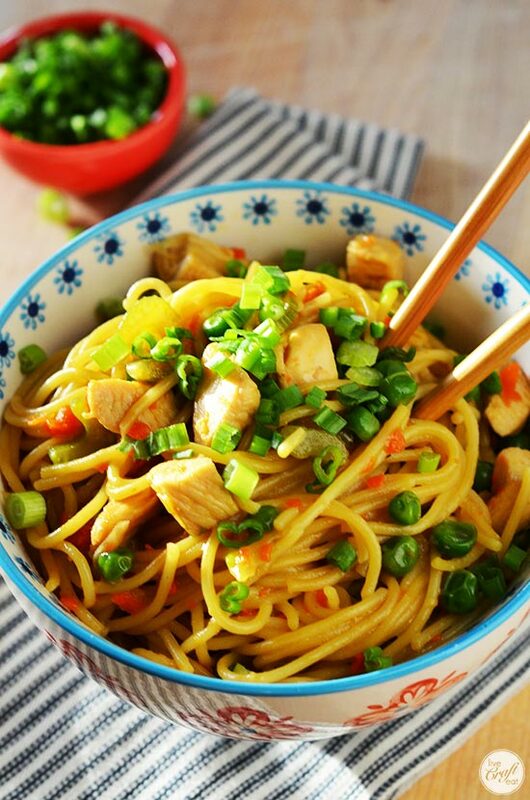 and just like that you’ve got an amazing homemade version of chicken lo mein, which, in my opinion, is just as awesome as going to a chinese restaurant – without the expense of eating out! print out this recipe to add to your collection! Dissolve bouillon in water in small saucepan. Pour ½ cup broth into large skillet. Let remaining liquid in saucepan cool. Bring broth in skillet to boiling. Add chicken and simmer 5 minutes, until no longer pink. 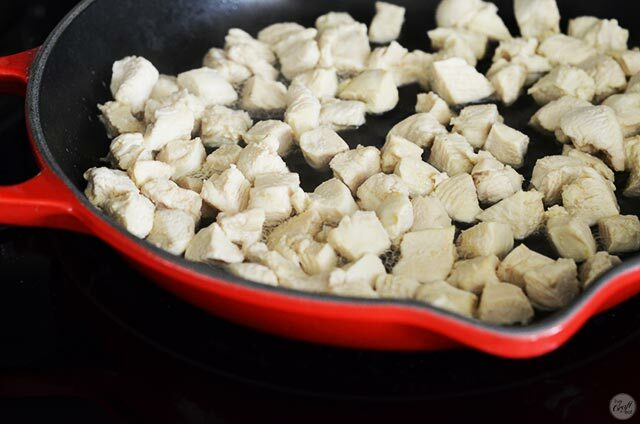 Remove chicken and discard excess liquid from skillet. 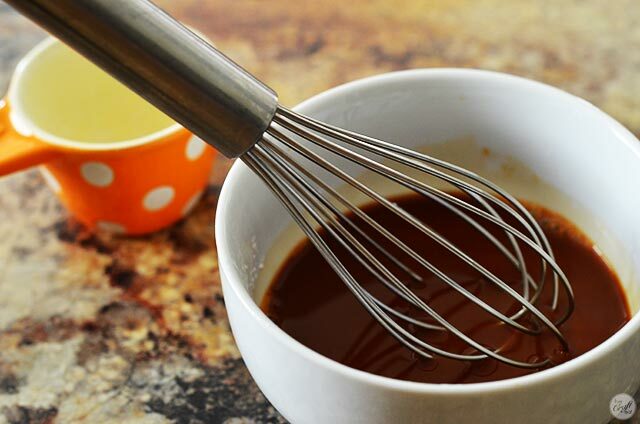 Stir soy sauce and cornstarch in a bowl with approximately ¼ cup water until smooth. Stir into broth in saucepan and set aside. Heat oil in skillet over medium-high heat. Add garlic and ginger; cook 30 seconds, stirring constantly so it won't burn. 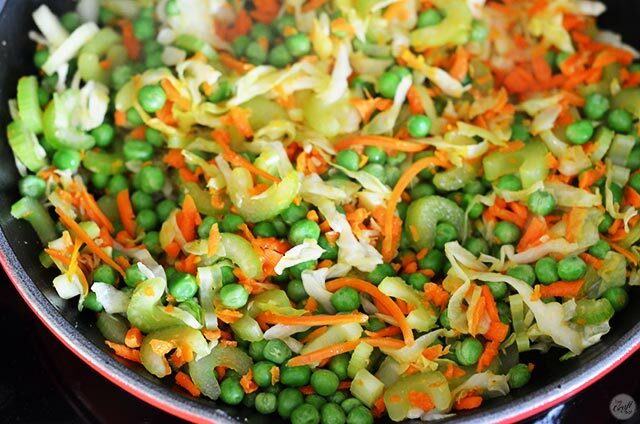 Add cabbage, celery, peas, and carrot. Cook, stirring, 1-2 minutes, until heated through. Stir cornstarch mixture in saucepan; add to skillet. Cook, stirring, 2-3 minutes until sauce has thickened slightly. Add cooked chicken and cooked spaghetti noodles and toss. Top with onion. 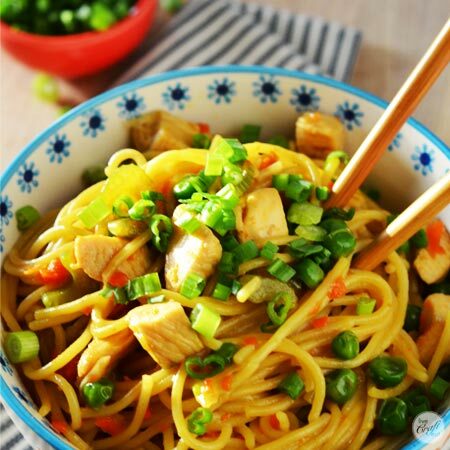 Jeff loves chinese food and this recipe looks doable and yummy!! Excited to try!